As the NHLPA marks its 50th anniversary in 2017, NHLPA.com looks back at some of the pivotal moments in the association’s history. In this piece, guest writer Russ Cohen travels back to the early 1990s, the first NHL players’ strike, and how small cardboard hockey pictures once relegated to bicycle spokes, quickly changed the business of hockey – on the players side – forever. Hockey trading cards are older than the NHL itself, and like their baseball counterparts, have a history that dates back to the promotion of tobacco products. In the 1950s and through the expansion era of the NHL, companies Topps and O-Pee-Chee were the household names – marketing successfully to hockey fans both young and old with an irresistible combination of sports and powdered bubblegum. Some of those same youngsters grew into eventual NHL superstars. While these cards were collected by the shoebox-full across the United States and Canada for several decades, it wasn’t until the early 1990s that NHL players understood how valuable their likenesses were to the sales of popular products just like this. Before 1991, the players never looked at the card and memorabilia business as the big moneymaker it eventually would be. 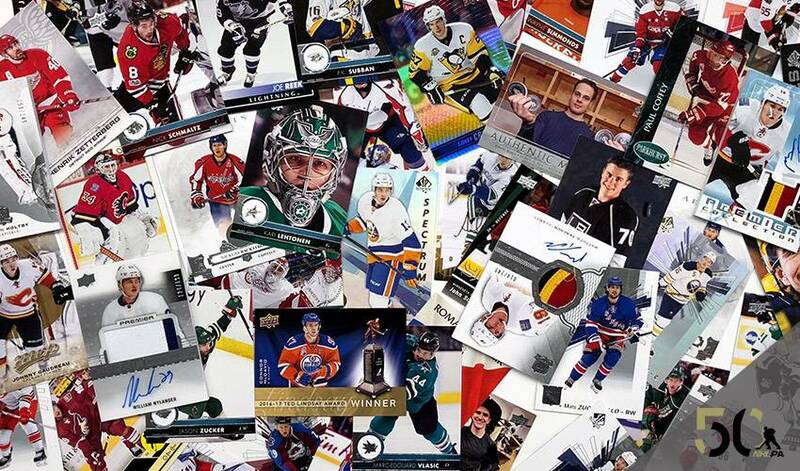 However, in less than five years, the NHLPA changed the way players viewed the card-collecting hobby and the way collectors viewed the players. “Hockey cards [have been] a huge source of income for the Players’ Association. It really was the starting point of saying we’re all together on this,” Lindros added. Former NHLPA consultant Chris Malone remembers being hired by the Players’ Association to help develop trading card licensing the way he had done previously with the NBA. And in the early half of the ’90s, trading card licensing absolutely was one of the union’s primary revenue sources. But it wasn’t until the resolution of the players’ 10-day strike in April 1992, that the players fully owned the rights to their own images – something not available to them under previous collective bargaining agreements with the NHL owners. “When the card boom took place, all of a sudden 50 to 100 million dollars’ worth of product was being sold. Where a nine or 10 percent royalty could be earned, now there were tens of millions of dollars (coming into) the players’ association,” said Malone, adding it could fund a more robust office staff to work in-house for the players in the areas of legal advocacy, insurance and health matters while managing the growing business opportunities for the collective membership. During the trading card boom period, California-based Upper Deck Company changed the way fans collected in the early 90s – first in baseball before they set their sights on the hockey card market – and the category would never be the same again. Upper Deck co-founder and CEO Richard McWilliam was a paper and packaging entrepreneur when his little card company shook up the sports industry. Truth be known, he wasn’t a sports guy when he started it all. But he had a great head for business and he was willing to take risks to do something unprecedented. In the 1990-91 season, he created a high-end hockey card set at a higher price and collectors couldn’t get enough of it. Flash forward to 1994-95, when the NHLPA’s Be A Player line was released for the first time, and the hobby was changed once again. Malone borrowed an idea from the NBA and used it to perfection with NHL players. Nobody had ever viewed hockey players in everyday poses in a card set before this. In addition to the off-ice profile shots – including photography from famed Sports Illustrated photographer Walter Iooss – the inaugural Be A Player Signature Collection was a groundbreaker for the card industry. While there had been certified hand-signed autographs randomly inserted in trading card packs before that year, the Be A Player Signature Collection was the first to provide collectors with one hand-signed card in every pack. While common among today’s card brands in all of the major sports, it was unheard of in 1994 – and succeeded only because of the players banding together to try something unique with their union. As with most of today’s on-card autograph card products, the biggest challenge in 1994 was getting all the autographed cards back in time. Only one player missed the return deadline, according to former Upper Deck staffer Rich Bradley. This represented the first time a card company had a decision to make so that the cards issued aligned with the checklist. In retrospect, Bradley is still impressed at how that first signature series came together so smoothly, and that the NHLPA members saw a similar set release every year well into the following decade. “This was probably the first time players were asked to sign a large number of cards,” said Bradley, adding that the inserts with players shown out of their NHL uniforms was a big selling feature for the Be A Player Signature Collection. “The players were being shown as people. These were more like ‘Be a Person’,” Bradley quipped. This was a very memorable time in the hockey world for a variety of reasons, namely in player rights. Without these important strides, the hockey card market – and maybe the sports trading card market as a whole – would look a lot different today. For all of the tremendous business growth the hockey card boom is linked to – not only in terms of licensing revenue, but the overall growth of the game in the ’90s – there is still very little that compares to the pride a young NHL player takes in seeing himself on a hockey card for the first time. Next to an NHL debut, it often ranks as a watershed moment when a player realizes he’s achieved his dream. Are you ready to rock? Erik Gudbranson certainly is. A bet’s a bet, and Ben Hutton learned the hard way that losing one to Erik Gudbranson results in sporting a brand new mullet.